ATLANTA (Dec. 13, 2018) – For three of the last four years, the North Carolina Agricultural and Technical State University football team has made the trek down Interstate 85 to play in the Air Force Reserve Celebration Bowl. This week, the university will feature brief stories highlighting the experiences of the players, coaches, alumni and fans as we cheer the team to victory against the Alcorn State Braves. See highlights of the team’s stay in Atlanta on the university’s main Facebook, Instagram and Twitter accounts. ATLANTA (Dec. 15, 2018) – Players, cheerleaders and Aggie football fans all agreed on one thing about the 2018 Air Force Reserve Celebration Bowl – it felt different. The two previous times the North Carolina A&T Football team attended the bowl, energy was high because in 2015, it was the first one, and because of the Aggies’ historic undefeated season in 2017. “Now, people are starting to understand the magnitude of a bowl game,” Lawhorn said. Senior cheerleader Talia Thomas agrees that the atmosphere is a bit more kicked up and has surpassed her expectations. “It is definitely a different vibe. I thought we would have been at a disadvantage by being on the away side this year but we weren’t. Our spirits (were) high,” she said. Both groups performed well in spite of a cold and snowy start to the week in Greensboro. With more than a foot of snow and the university on suspended operations for two days, the band and cheerleaders lost valuable practice time. 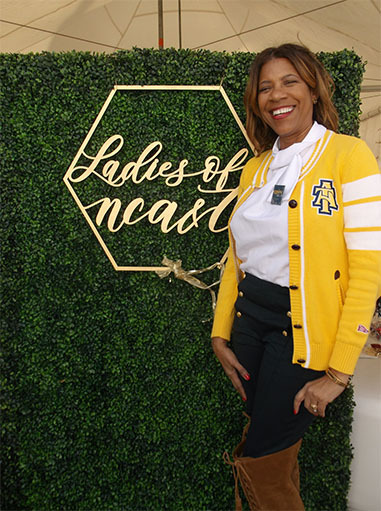 ATLANTA (Dec. 15, 2018) – When Donna Ford (‘86) began the Ladies of NC A&T (LOAT) group on the social media platform Facebook, it was only open to women in her home city of Atlanta. Now with more than 12,000 members, LOAT serves as a group of ambassadors for North Carolina Agricultural and Technical State University and stands on four pillars: giving back, building community, economic empowerment and living well. As a first step in fulfilling the first pillar, LOAT ran a campaign selling gold LOAT sweaters that raised approximately $10,000 for the cheer and volleyball teams. For Ford, LOAT is simply an extension of the love she and her family have for A&T. She and her husband, Daniel, have established an endowed scholarship that is one payment away from fulfillment. “We both come from families where we were first-generation college students. We both paid our way, and now we are committed to helping students not have the same distractions we had having to work our way through school,” she said. Prior to the start of the 2018 Air Force Reserve Celebration Bowl, Ford and her LOAT sisters hosted a VIP (Vested in Purpose) tailgate experience for those members of LOAT who have participated in the current campaign. Friday evening, the Aggie Athletic Foundation (AAF) hosted a reception for donors and friends in town for the bowl. Attendees were encouraged to give to the AAF to help reach the $1 million annual goal by Dec. 31. Prior to the reception, AAF was just $150,000 shy of its goal. ATLANTA (Dec. 15, 2018) – As the events leading up to the big game started to wind down, a handful of North Carolina A&T football players spent their Friday morning spreading a little holiday cheer and Aggie Spirit at Children's Healthcare of Atlanta at Hughes Spalding. 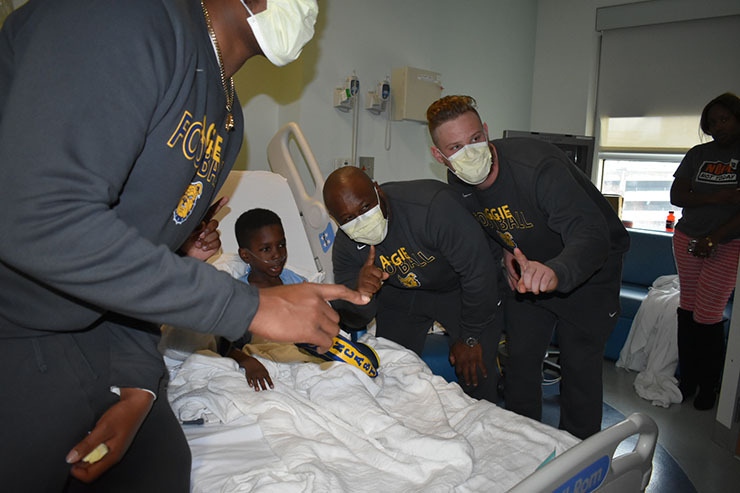 Players from the Alcorn State Braves football team joined the Aggies in presenting ailing children with university-branded gifts and words of motivation and encouragement. This is Bush’s first trip to the Celebration Bowl and Reynolds’ second. While they remained focused on the game, the pair agree that their presence at Hughes Spalding was just as impactful on them as it was the children. ATLANTA (Dec. 14, 2018) – As seniors on the North Carolina Agricultural and Technical State University Aggies football team, Lamar Raynard and Leroy Hill get to view this year’s trip to the Air Force Reserve Celebration Bowl from a unique position. Hill agrees and said that while all the events are great, he and his teammates must stay focused on the matter at hand. Though the pair is staying focused in Atlanta, they got to celebrate their former coach, Rod Broadway, who was inducted into the Celebration Bowl Champions Circle at the Chik-fil-A College Football Hall of Fame, and enjoy themselves at various events. 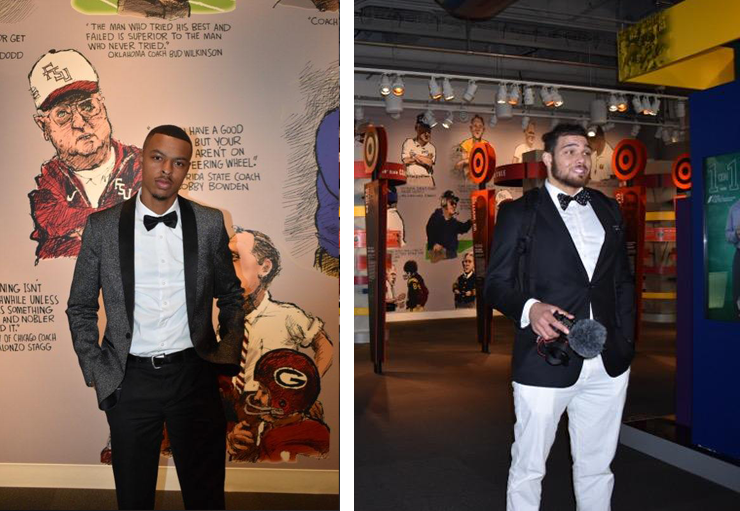 ATLANTA (Dec. 13, 2018) – On the far side of Oceans Ballroom at the Georgia Aquarium, the N.C. A&T Aggies football team sat down to a champion’s feast on Wednesday opposite a familiar opponent in the Alcorn State Braves. With Saturday’s Celebration Bowl at the top of the players and coaches minds, ESPN SportsCenter Anchor Jay Harris got the competition started early with a friendly game of Celebration Bowl Family Feud before a private tour of the massive aquarium. 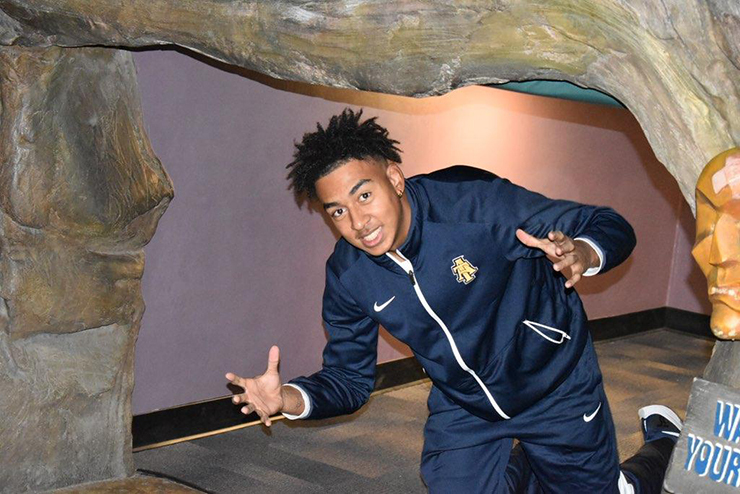 Though many of the upperclassmen on the Aggie football team have visited the aquarium as a part of the team’s two previous bowl appearances, kicker Michael Rivers was there for the first time. That peace for Rivers may be exactly what he needs after what he describes as an intense, yet predictable season. “Aggie football is exactly what I expected. It’s been a lot of hard work – intense work. But this is what I expected, to win a lot of games and to get back to the Celebration Bowl,” he said. While the team works to stay focused on Saturday’s nationally televised game, the first of the college bowl season, Rivers is also looking forward to visiting the Chick-fil-A College Football Hall of Fame on Thursday. “It’s going to be great for us to see representations of ourselves,” he said. The Aggies face the Braves at noon, Saturday in Mercedes-Benz Stadium in Atlanta. Watch live on ABC.